Our local buddy Jak, Jakob Glassl, was long disappeared. He is a close long-time friend to Sebastian “Luckbox and was spending his time with us often before virtually disappearing. Nobody, not even Seb did know anything. His screenname on party remained grey, his messenger off, his cell phone also. Month went by, all trys failed. Rumors, had, well, he was broke and want’s to see nobody. A few weeks ago Seb managed to contact him, convinced him that all is OK whatever it is (as friends should do) and Jak appeared again. He went a few times with us to Schenefeld, playing tourneys. Sunday a week ago he was partying because he managed to qualify for the Aussie Million in Melbourne in the very last satellite so he was going along with Seb who qualified weeks ago already. After troubles with passports, airfaires etc. on short notice he managed to get there. And now he is there. Sitting between the last 13 players in the big tourney. With a $100,000 guaranteed payday. Wow. That is the best and most deserved comeback for a real cool guy ever. 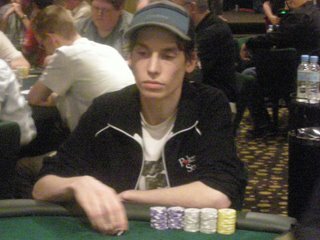 Right now he has only half-average chips but Day3 has closed for now so he can get back some tomorrow with fresh energy. The english PokerStars blog posts live updates about that event. I myself struggle between hard work, live play and being ill. The flue got me. So hard that I even had to leave a wild live game (yes, with Hassan) yesterday after only one hour. No more concentration possible. Katja stayed, won a little. Oh and the Real German Championship competition is almost finished, we have four players left now, all in the money. As expected two well known pro’s are between those, Thang and Christoph “Sassenage”. All results here.